The great advantage to a modernist history play is that it can offer audiences a new perspective on a familiar moment in time. The Lincoln Vaudeville, as performed last weekend at Trinity College, was a visual explosion of light and color, as overwhelming to the senses as the deep dark tones of the 1860’s were not. It should be understood that the genre of this play was born out of the “epic” history plays of Bertolt Brecht, which deliberately create distance between the play and the audience. This defamiliarization of historical scenes meant that many costumes and references would be alien to the period described, and the play might be filled with songs. The aim, in these plays, is generally to make viewers “engage” with the material rather than only engross them in it. The cast wore garments that suggested historical styles only, and the script was strewn with references to the politics and popular culture of 2018 almost from the first minutes of the play. The result was overwhelming and always lighthearted. Another way the desired emotional distance was maintained was the constant shuffling of the cast. James Calabresi ’20 played Lincoln with real warmth and hominess, constantly confused since the play’s version of Lincoln has a slightly goofy, fumbling naïveté. Though Calabresi was the most visually similar and stylistically developed match out of the three actors who played the president, there was no main performer for that or any role. Though the racial difference of actors from the historical figures they were playing was not explicitly mentioned, it became situationally meaningful as the play continued. The moment when actress of color Mandisa Harewood ’21 took up the role of Lincoln by putting on his hat was one of the most powerful in the play, especially as a foil to Lincoln’s early hesitance to free black Americans from slavery. Though these changes could be confusing, they also offered a variety of takes on Lincoln, some more somber or more radical than others. Of the cast, it is not easy to isolate a group of main characters. The inexhaustible ringleader of the circus-like “acts” of the play was nineteenth century comic Dan Rice, played with high energy and catlike balance by Brian Cieplicki ’19. But the crux of the play, or its moral heart lay in the conversations of Lincoln and Frederick Douglass, played by Jamil Ragland ’13 with a beautifully realized frustration and impatience with Calabresi’s Lincoln. Sharing the role with Harewood, Ragland’s energy was nervous and angry, and though their scenes together are abstract and fictionalized, the Lincoln-Douglass exchanges offer some hidden truth about “real” history that the bulk of other scenes do not attempt to capture. Noelle Lucien’ 20 and Elisabed Gedevanishvili ’20 share the role of Mary-Todd Lincoln, who is given a non-traditionally large amount of attention in The Lincoln Vaudeville. Both performers bring something unique to the role, and Lucien’s balance-beam monologue especially was mystifying and impressive. Vaudeville would have its audience rethink Mary-Todd not as the spendthrift housewife or emotionally unstable invalid she is usually portrayed to be, but a more manipulative character, giving life to a tired trope by whispering commands in her husband’s ear and secretly controlling American politics with intrigue. This would be less tedious to grapple with if Eliza Johnson, wife of the vice president, were not constantly doing the same thing, apparently to cause chaos. In a play without many discernable thematic elements, this recurring motif feels too prominent. Among the funniest performers of the play was John-Paul Masaryk ’19. Masaryk’s sheer talent for physical comedy and perfectly grotesque southern voices frequently made him a scene-stealer. Vaudeville’s Jefferson Davis character is little more than an unhinged alcoholic taken straight from northern war propaganda. Though this choice once again offers little insight, It is impossible not to love Masaryk’s performance in the role, and throughout the play. Claire Pritchard ’20 embraced a dual performance, one moment playing a Vaudevillian performer with over the top physicality, the next a Civil War era racist. Such transformations as these should be applauded in every cast member. The hand of Director Michael Preston could be felt in the self-evident balance between each of the actors, and the overall tightness of the performance. Everything about the execution of the play, down to its vibrant and highly effective lighting design, was crisp and clear. A failing of the play lies in its priorities. The script is preoccupied with the need to be innovative in Brechtian ways, and it drifts ever farther from its source material. Passing through topics of grief, mass death and systemic suffering, Vaudeville prefers to acknowledge them with some fleeting wordplay or sight gag. Instead of repackaging the horrors and legacy of the civil war in an uncharacteristically human way, they are enhanced with “what if” moments that offer little or no new insights into history, or the idea of history. A good example comes near the end of the play, when the characters of Andrew Johnson and his wife, played with great comedy and unmissable villainy by Divina Lama ’21 and Olivia Spofford ’19 hire John Wilkes Booth (Masaryk) to assassinate president Lincoln with the aim of personally causing the misery of reconstruction in the South. It is unclear why moments like this are needed: why rewrite a complex, multi-faceted tragedy as one couple’s evil plot? The play would have had more purpose if the nuances of the Civil War had been boiled to their simplest form and expressed, rather than being replaced with a simplified alternate version. All of these historical figures become caricatures of caricatures in the funhouse mirror of The Lincoln Vaudeville. But what does this really accomplish in terms of altering our collective memory? The Lincoln Vaudeville is an unconventional, frequently jarring and at times brilliant play with problems. 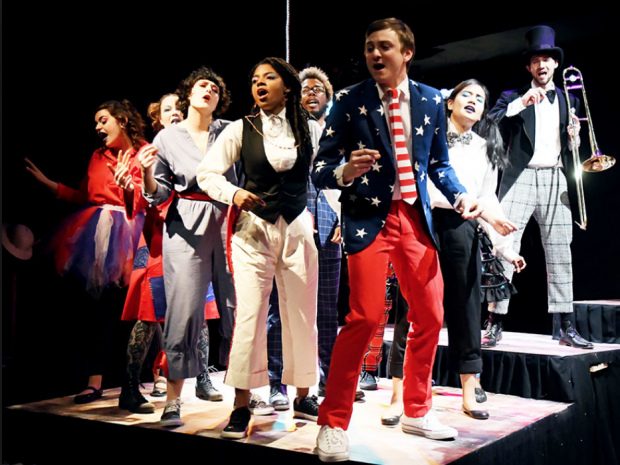 It offered a very fine cast of students and actors the opportunity to enter uncharted territory and bring something special to the stage, and gave audience the chance to laugh and puzzle over something they will be thinking of for a long time.